Thank you to our volunteers from Liberty Mutual for giving back to the children and youth of HeartShare St. Vincent’s Services! HeartShare St. Vincent’s Services welcomed Liberty Mutual for a Day of Service on Thursday, May 11 at its Wyckoff Gardens Cornerstone Program in Boerum Hill, Brooklyn. Jennifer Maas, a member of the HSVS Junior Board, made the connection. “We (the Junior Board members) are always trying to find ways to help out,” said Jennifer. “I care so much about the HSVS mission and I wanted to share that mission with my colleagues. There’s no better way to do this than welcome them to one of the programs in the local community.” Liberty Mutual has a program called Serve with Liberty, where more than half of employees globally engage in community service efforts from May 1st through May 12th. The Wyckoff Gardens Cornerstone Program is one of HeartShare’s after-school and summer camp programs, which cultivate skills in academics, leadership, athletics, the arts, dance and more. 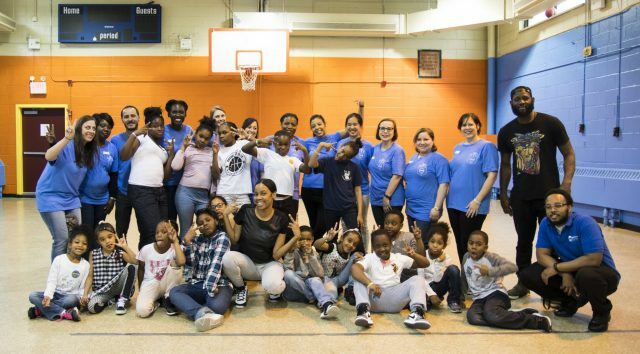 Learn more about HeartShare St. Vincent’s Services Youth Development programs: https://hsvsnyc.org/our-divisions/youth-development-community-programs/.